Given just a little opportunity, we could have made the crossing without jeopardizing our life or our boat. Nature kept the last word… beautifull one day, in fury the next one. We need to stay humble! Nature kept the last word. That’s great! A humility lesson in learning to respect its power. To your sorrow, you can do foolish things up north, playing the invincible hero against the ice-pack and the arctic weather. To survive, experienced sailors learn to be unpretentious. At sea, you find out quickly your human limits in front of unlimited natural forces. Two days ago, even with its immense raw power, its thickened hull and its enormous inertia, a Russian cruise-ship got trapped by the ice. The vessel ran aground. If those mammoth ocean liners manage to get in such troubles, imagine now a yellow home-made wooden boat, even “hardened”, in the middle of this maelström! Retreating was not only a wise decision, it was our only possible option! After a last incursion north to accommodate our filmmakers, we planned to close our North West expedition by anchoring in Pond Inlet, our last outpost in the Arctic. Along the road many retreating glaciers remember us about the quick warming of this area. 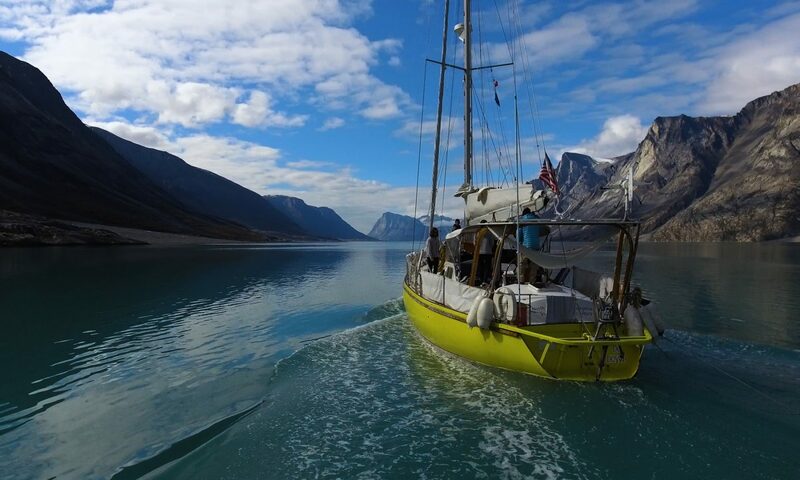 In the canal toward this anchorage, the wind blows strong, right on the nose with a choppy sea. All that made for a difficult sailing. The wind blows strong, right on the nose with a choppy sea. In the northern latitudes, adapt! A look at the chart: “Emmerson Island” appears nice and being down-wind, offers the promise of a smooth ride. We will wait there until the wind calms down. Three hours later, we drop the hook in a gorgeous place surrounded by high mountains topped with snowy summits. Unfortunately, I have a bad feeling. Nice surroundings don’t make for a good anchorage. This one doesn’t look right. The holding? the protection ? I cannot exactly pinpoint what’s wrong. Parking your car, the keys in your pocket, you don’t worry any more until your next move. A lot of birds fly around the anchorage and above the island. What about a fat roasted goose for supper? With my gun, Dom and Joe start a hunting expedition. No luck. If they return empty-handed, they confirm the presence of some geese on a pond farther up on land. Their “anchor watch” assignment now. My turn to try my luck with Eric. Can you believe that he never hunted before? I plan to make him learn some basic gun use: a part of his drill as an US navy seal. Up and down and over the rocks we go. Walking on this island is not an easy task. We notice finally the little pond Joe and Dom were talking about. It’s still far away. Eric turns around to pick up the dinghy and bring it closer. I keep hunting. I silently get close to the pond. There are fowls in the water. Supper is at hand. I quietly approach. Mommy goose and her babies are frolicking around. My father, a great hunter himself, showed me to hunt animals, not to murder them! Now dead, my dear old man wrote in his time some interesting books about the art of hunting. My father enjoyed hunting and writing about his passion. No way to shoot such a nice family. He would rise in fury from his coffin ! I pass my turn and hide behind a rock. I enjoy the sight of these young birds learning to dive for food following their mother’s teaching. How nice ! They need to gain strength quickly before their long October migration towards warmer winter grounds. Two birds come flying right towards me. They get closer and closer. Now, my adrenaline rises. I enjoy this ancien hunter excitement coming with a possible success . At the last second, with the birds passing right over me, I rise from my hiding spot and shoot one of them. It falls at no more than 10 feet. Some would argue that this is not a perfect “king shot”. The bird is supposed to fall right into your hands. Grumpy people! Pretty sure that my father would give me a perfect mark for this beautiful shot. One only regret: Eric was still bringing the dinghy close by. As part of his gun training, he missed the opportunity to see an elite sharpshooter at work! An elite sharpshooter at work..
What about the second bird? It gets the protection of some rocks and disappeared. Bird in hand and returning toward Eric, a white fat hare appears for a few seconds between the rocks. I don’t get any chance. Good for the rabbit, bad for me; Yin and Yang as goes the Chinese saying. A pity also for my crew. Those who tasted my traditional Brittany recipe of “hare stew with buttered oignons”, slowly cooked on my wood stove, unanimously agreed. By far, the best stew ever offered on a sailboat. With “crêpes de Quimper” as dessert, my mouth is already watering with ancient memories . For the “Crêpes“, better follow my wife recipe. I suppose you want also to avoid a serious cooking pan head blow. My “crêpes de Quimper” are not PANCAKES damn it! Never, ever, tell her that her “ crêpes” look like an American pancake! Returning to the dinghy, I was dreaming about these pleasant memories when we got a VHF call from Joe. “Please, show up quickly onboard. The boat is getting way to close to shore”. Return to the boating life reality. On Breskell, the engine was already running, my crew safeguarding the hull out of some dangerous rocks. A good decision to keep this anchor watch! I try to anchor around a few more times. I was not happy with any other spots. We left for Pond Inlet….